Hello friends, and happy September! Oh my gosh this has been a whirlwind summer. I’m currently sitting on the deck listening to the mariachi radio coming from the apartment building across the alley (seriously), soaking in the last bit of humid summer-y weather here in Chicago where it lasts. I’m more than ready for some fresh crisp fall air but NEVER ready for winter here...so trying to stay present and enjoy the moment! I owe you a big juicy life update letter and will send it soon I promise! If we aren’t already virtual penpals you can subscribe to my semi-regular newsletter here. This weekend I was inspired to bake, and decided to make granola. Homemade granola used to be a staple in my kitchen back in my grad school days, and it’s so freaking good and easy to throw together. The only trick is to NOT over-bake, and don’t add dried fruit or chocolate chips to the mix before you bake it. Just don’t. The fun part is that you can mix in whatever ingredients you have on hand and make your favorite flavor combos using this basic recipe. This granola is healthy, but it’s not low calorie...and it’s incredibly addicting. So proceed with caution ! Serve with yogurt, top your smoothie bowl, eat by the handful. 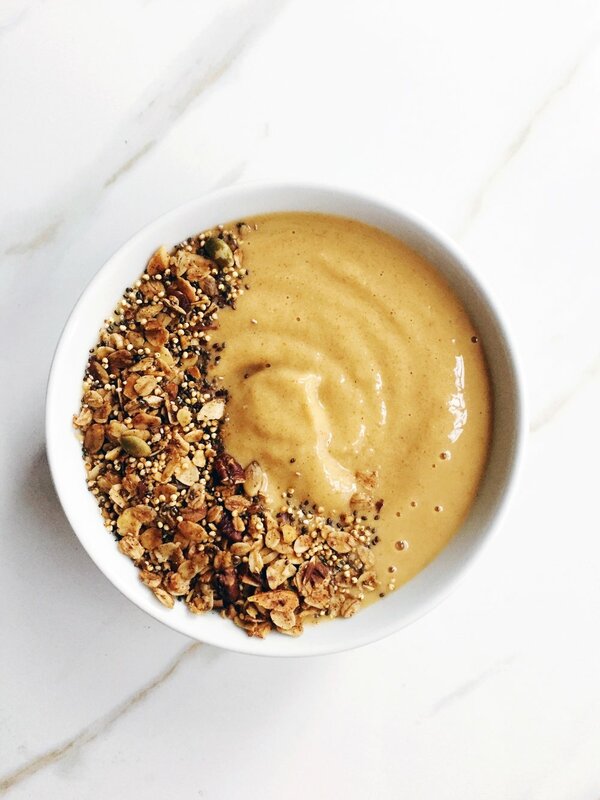 I've been loving it on top of a pumpkin spice smoothie bowl, or with frozen cherries and Greek yogurt. NOM! There are so many flavor combos you could try. I can't wait to keep experimenting!